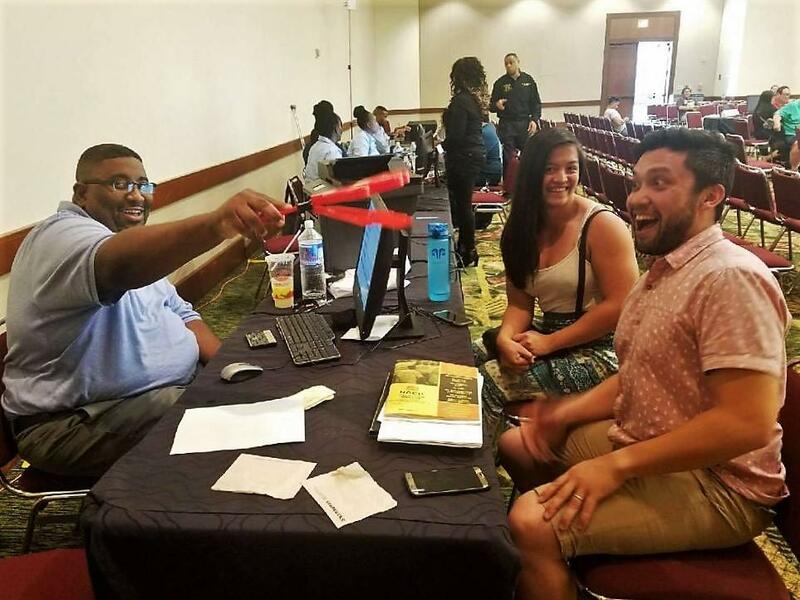 Hawai'i homebuyers Billy and Joey Friels sit down with counselors from the national non-profit Neighborhood Assistance Corporation of America to go over the final details of their mortgage application. Construction worker Billy Friel and his wife Joey live with their four teenagers in Waimanalo. For seven years, they’ve been renting from friends and family to save up for their own place – something they still can’t afford. 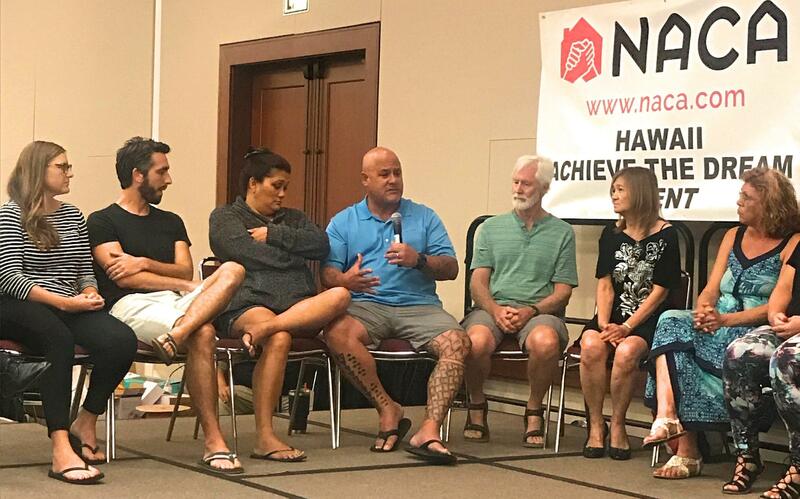 Construction worker Billy Friels (with mic) shares his thoughts on the hardships of buying a home in Hawai'i at the NACA's "Achieve the Dream" event at the Hawai'i Convention Center. “I put up high rises and listen to the developers talk about having affordable units and I just don’t know who it’s affordable for?” says Friel. 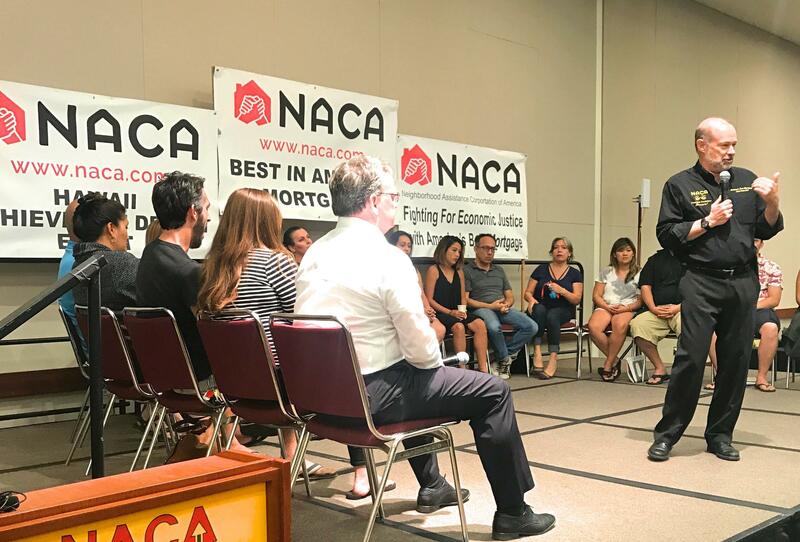 Friel heard about a new mortgage program in Hawai’i offered by Boston-based housing non-profit Neighborhood Assistance Corporation of America or NACA. “You can get a mortgage with no down payment, no closing costs, no fees, at a below-market fixed-rate and we don’t consider your credit score,” says Marks. NACA Founder & CEO Bruce Marks addresses homebuyers at the Hawai'i Convention Center. Marks launched NACA's Hawai'i debut late last week. The Boston-based non-profit has been fighting predatory and discriminatory lending practices in the housing industry for 32 years. Bruce Marks is the organization’s founder and CEO. 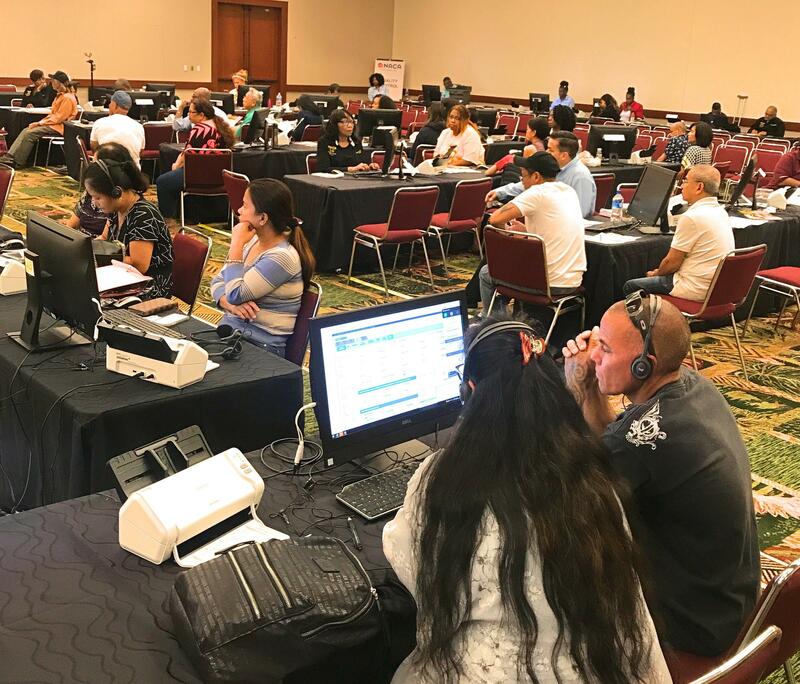 Hawai'i homebuyers go through the final stages of pre-approval for the Best in America Mortgage offered by NACA. The mortgage program include no down payment, no closing costs, and low interest rates. Then they qualify people for a mortgage based on what they currently pay for rent and what they save every month. 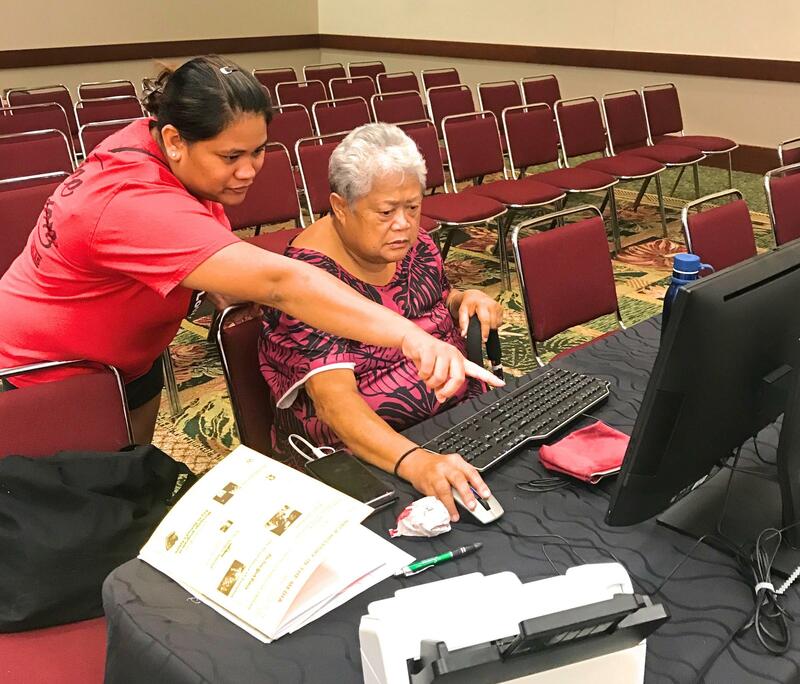 Local 5 Union member and hotel worker Cesilee Linares (left) helps a prospective homebuyer upload documents to NACA's system. 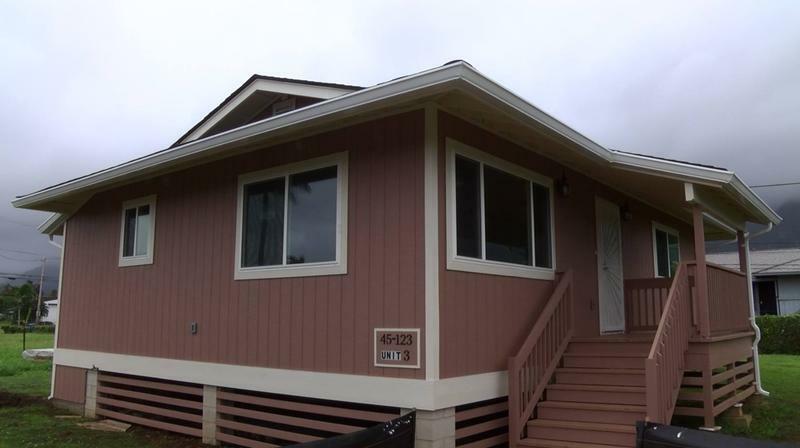 “Actually in Hawai’i, you know people are paying such a high amount in rent that they can take that same amount they’re paying in rent and use it on a mortgage payment,” says Marks. Marks says about 700 people attended the group’s workshops over the weekend. They were co-sponsored by the Local 5 union as part of their “One Job Should Be Enough” campaign. Here’s union member and hotel worker Cesilee Linares. “Honestly when I first heard of it, I thought it was too good to be true,” says Linares. 29-year-old Linares and her husband Jaren both work for the Hilton Waikiki. Jaren also makes extra money driving for the ride-sharing company Lyft. Nic Groves and his wife Paola Rodales get word that NACA approved their mortgage application for as much as $500,000. “Currently we’re renting in Honolulu and we pay $1,400 a month…for a two-bedroom,” says Linares. The couple have a six-year-old son and a baby on the way in Janaury – and hopes for a mortgage approval.Homeownership came quicker than expected for 29-year-old Nic Groves and his wife Paola Rodales. NACA approved the couple for as much as $500,000. As for the Friels, they’re in the final stages of pre-approval. They spent nearly all day at the workshop. 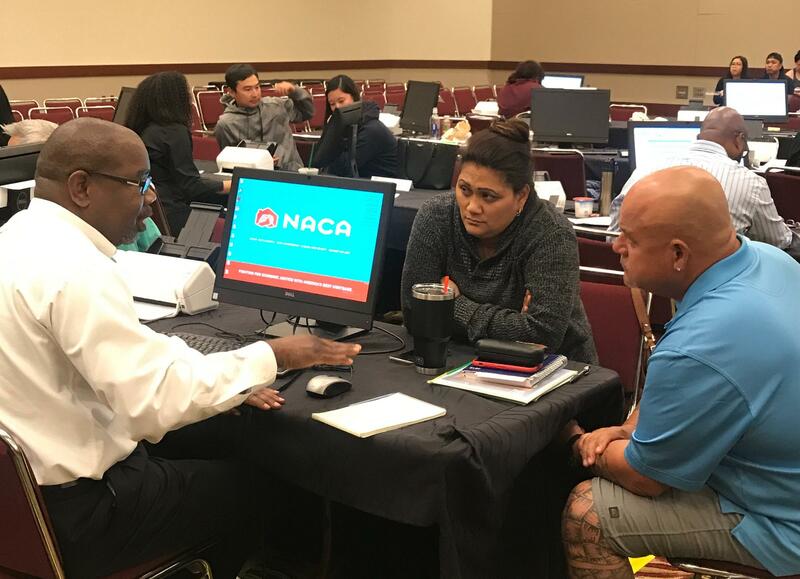 NACA's homeownership event continues through Tuesday, July 10, 2018, from 6:00 a.m. to 6:00 p.m. at the Hawai'i Convention Center. Bring financial documents such as pay stubs, W-2s, tax returns, bank statements and credit card statements. For more information, visit NACA.com.